Set aside the questions of whether it’s wise to put a wall along the U.S.-Mexico border or who should pay for it. It simply can’t be done at the price Donald Trump has claimed. While promising to put up a high concrete wall along the Mexican border, Donald Trump said it would cost between $8 billion and $12 billion. Fat chance. That becomes apparent after you look at what’s already on the border. After initially proposing to wall off all 2,000 miles, Trump said the wall could run along roughly half of the border, with mountains and other natural barriers blocking immigrants from crossing elsewhere. And on the portion where Trump envisions a wall, there are already 653 miles of fencing—some designed to stop cars, some to stop pedestrians, depending on the likeliest mode of crossing in each section. Building those fences has cost $2.3 billion since 2006. 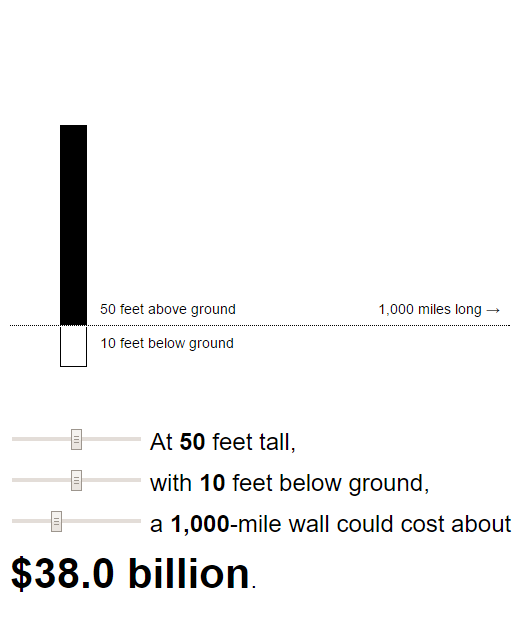 If you wanted a wall instead of a fence—and if it truly were, as Trump has promised, 35 to 65 feet of concrete reinforced with steel—then the costs would mount extremely fast. 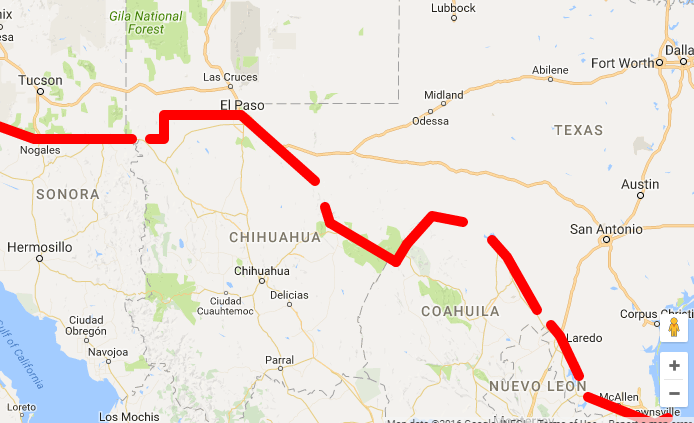 Imagine a 1,000-mile wall, at a height of about 50 feet, the middle of the range that Trump has thrown out. Then suppose the wall extended 15 feet underground—a little more than is structurally necessary for a foundation, but enough to deter some tunnelers. You wouldn’t really build a long wall at a constant thickness, but let’s assume that on average, it’s one foot thick—enough to make a 50-foot wall stable and hard to cut through, a concern that Trump and his supporters have raised with the existing border fence. This gives you a volume of about 12.7 million cubic yards, or 9.7 million cubic meters. Since structural concrete for this would cost about $900 per cubic meter, we’re talking almost $9 billion. Steel reinforcement, or rebar, could take up about 3 percent of the volume of the concrete. That amount of rebar would weigh about 2.3 billion kilograms. At roughly $2 per kilogram, count on spending $4.6 billion for steel. If you assumed the same labor costs as what went into putting up the border fences between 2006 and 2009, and added that to the expense of the concrete and steel, the total cost of a wall might be $15 billion. But the labor for such a project would be much more expensive, especially since the parts of the border that are still open are more rugged. Consider Israel’s experience. It has built 320 miles of a planned 480-mile barrier in and around the West Bank. Only three to 10 percent of the completed portion is concrete. The cost so far: $2.6 billion, more than twice as much per mile as the fences along the U.S.-Mexico border, even though labor in Israel is slightly cheaper. That fits with what structural engineers have told me: the total cost of highways and other megascale projects in the U.S. is generally two to three times the material costs. That makes a 1,000-mile wall pencil out at $27 billion to $40 billion. Trump might say it would be worth the cost since border crossings are out of control. However, because of several factors, including improvements in the Mexican economy and increases in Border Patrol staffing, fewer people are making the attempt. Officers caught 331,000 people crossing the Mexican border in fiscal 2015, less than one-fifth the number in 2000. Konstantin Kakaes is an editor at MIT Technology Review, where he focuses on commissioning and editing long-form features for the print magazine. He is currently the journalist-in-residence at the Simons Institute for the Theory of Computing… More at UC Berkeley.